Marriage is a sacrament which lasts until death. We are here to help you to prepare for this profound experience of God’s love that will be showered upon you on your wedding day and every day of your married life. Marriage is a sacrament which involves a lifelong commitment. Couple contemplating marriage at Immaculate Conception should contact the parish office and make an appointment at least one year in advance. Proper preparation is important and necessary. The parish family of Immaculate Conception Church offers to support and guide you as you prepare for your wedding. There are many things to be done, so you spiritual development as couple should be an important aspect of your marriage preparation. As you enter the church and come before the altar, you are treading the steps which many others have taken. These steps represent a new identity which will be centered on a relationship built on faith in God and faith in each other. The sacraments are essential to the life of the church. Therefore, adequate marriage preparation is necessary for the reception of the sacrament of matrimony. In this way, your life of faith will come alive and be realized by those around you. Pray often in the days ahead, both alone and together so that the Holy Spirit may be upon your endeavours. We recommend that you make frequent use of the sacrament of reconciliation, particularly prior to your wedding. This sacrament affords you the opportunity to experience the forgiveness of the Lord and the strength to resist temptation. We also recommend that you attend weekday Mass from time to time so that you may be strengthened by the Eucharist. By making Jesus number one in your life, you will be truly preparing for the sacrament of marriage. Finally, all couples preparing to be married should attend Mass each Sunday. Your presence is important not only for one another, but also for the parish community. It also makes your church ceremony more credible. People who are not baptised at Immaculate Conception must contact the church of their b baptism to receive an original certified copy of the baptismal certificate, least six months prior to the wedding date. This copy is for our file and won’t be given back to you. Also the church requests the copy of your confirmation. Because marriage in the Catholic Church is a sacrament, either the best man or the maid of honour, preferably both should be practicing Catholics. The state marriage license is obtained from the town of the bride or groom. Two witness will also be needed (over 18 years) when you apply for the license. The witnesses must know both the bride and the groom. The civil license, church and music fees should be brought to the day of the rehearsal. In preparation for the sacrament of matrimony, you are asked to attend the following steps. Initial Meeting – Nuptial Investigation. (Please bring to this meeting the baptismal, confirmation certificates, and act of divorce or nullity if you have been married before). During the second meeting the couple is asked to do a marriage survey- this is a pre-marital instrument use by the Archdiocese of Newark given to all couples who are getting married in the Catholic Church. The third meeting is set up by the priest after he gets the results of the pre-marital instrument or marriage survey. (It is possible that the priest ask for a second meeting to continue reviewing the results of the survey). 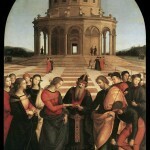 A fourth meeting is set up only after the couple has attended the Pre-Cana. Important that you bring the certificate that you really attended the pre-marital formation. Liturgy Review (preparation of how the wedding ceremony is going to be celebrated). Meeting with the best man and the maid of honor and the couple to sign the marriage license issue by the state of New Jersey at the City Hall which is not issue more than 30 days previous of the wedding. Archdiocesan policy requires each couple to attend either Pre-Cana or Engaged Encounter. Plans to attend either one should be made well in advance. Arrangements for music are to be made with the parish director of music. The couple may select music which reflects the dignified worship of God. Secular music is not appropriate. Call music director one month prior to your wedding date. Floral decorations should include two baskets on the sanctuary steps. It is customary to leave flowers for the decoration of the church during the weekend. No form of tape or adhesive may be used to secure decorations to church furnishing. Please advise your florist of this. During Christmas and Easter seasons, the church sanctuary is already decorated with floral pieces, making the purchase of extra floral pieces unnecessary. Please contact the parish office as to whether there are other weddings prior to yours on the same day. In choosing photographers and videographers, please know that they must not distract those who attend the ceremony or the bride and groom. No photos or videos are to be taken from within the sanctuary. This is to ensure both reverence for God and the prevention of unnecessary distractions. The throwing of rice at the end of the ceremony and the dropping of flower pedals along the altar is prohibited. Please inform our guests of this policy. Fees are to be presented at or before the wedding rehearsal. If there is a request for someone other than our contracted musicians for your wedding, our music director and cantor are to receive their fees in addition to whatever fees are required of the outside musicians. Checks for the church are to be made payable to: Immaculate Conception Church. Finally, we ask that if you will be living in Secaucus after your marriage that you notify the parish of your new address. If you are moving, we encourage you to register at the local parish in your new neighborhood. Your faith life must be continually nurtured in an environment conducive to spiritual grow.